In the growing field of free Internet instant messaging services, RocketTalk is one that stands out. The new beta release for the service, which provides real-time audio messaging with buddy lists, adds text to the audio, making it a complete IM tool. 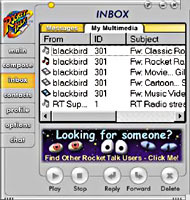 RocketTalk's inbox lets users switch between text messages and multimedia transmissions. The RocketTalk service also adds streaming video, though the combined text and audio messaging are currently the most useful for office use. Using RocketTalk is easy; just go to the company's site, at www.rockettalk.com, and download a 4.4M utility that installs on any Microsoft Windows system. The audio isn't the same as a telephone conversation. It's more like using a walkie-talkie, with which only one person can be heard at a time. But in some contentious meetings that can actually be an advantage. RocketTalk Inc.'s software lets you establish your own level of availability. Set it to Sneaky and you can send and receive messages without being bothered with lots of other calls.
' Try before you buy: Instant messaging services are free from several Web sites.
' Be wary of future compliance: The battle over IM standards could make an expensive IM system an in-house-only investment.
' Check the features: Some software includes voice, security measures and a whiteboard for instant meetings.
' Consider the options: A category of service called integrated messaging puts voice mail, e-mail and fax all in the same inbox to make managing all messages easier. Set it to Available and all other users on your contact list can see that you are available to receive instant voice and text messages. The sound quality is excellent; I found it to be as good as my telephone connection. The software also lets you interact online or compose and save messages offline. There are some slight delays involved because the sound isn't streamed; it is downloaded before playback starts. But a 10-second audio message only takes about 15 seconds to download with a 28.8-Kbps dial-up connection. Unlike voice over IP, which requires fast connections, RocketTalk doesn't use streaming audio so it works even with very slow dial-up connections. And if you want to communicate with someone who isn't already signed up at RocketTalk, you can e-mail them an audio message that will be delivered with a small utility to play your message and text instructions for using it. The only restriction is a two-minute limit on the audio message. There's no limit to the number of separate two-minute messages you can send. There are compatibility problems with some firewalls and proxy servers but the company said it will address many of these in its next release.